Lots Of KPS Grads Start College On The Promise. Why Aren't More Of Them Finishing? Proud parents and staff fill the small school gymnasium with excitement and cheer as students’ names are called. The event, on a breezy September evening, is not a graduation. It’s a “Promise Signing Day” for the 2018-19 kindergarten class of Northeastern Elementary School. Students’ names are called by their teachers and they receive a certificate from Kalamazoo Promise Executive Director Bob Jorth and Kalamazoo Public Schools Superintendent Michael Rice. The certificate lists the students’ expected 2031 graduation date and a set of signed “promises” from KPS, parents and the Kalamazoo Promise to support the “College Going/Career Pursuing” student. The Promise, which turns 14 this year, is a scholarship program for students who graduate from KPS and go to any one of more than 50 in-state post-secondary institutions. It pays full tuition for graduates who attend school in the district from Kindergarten through 12th grade, and a sliding-scale amount for graduates who start later (they must spend at least 9th through 12th grade in KPS to qualify). The vast majority of eligible KPS grads start college or vocational school on the Promise. But a lot fewer of them graduate – at least, that’s what the numbers show for the classes whose time to use the Promise is up. And one analysis found that black and Hispanic Promise students were the least likely to finish a bachelor’s degree, even though black students make up the majority of KPS’ students. For the 2017-18 school year, there were 4,065 white students compared to 5,003 black students. The next highest demographic is made of Hispanic or Latino students at 1,686. The Promise is the pride of KPS. Superintendent Michael Rice credits the scholarship with reviving the district. And KPS students have embraced the Promise. In the first three classes to receive it, in 2006, 2007 and 2008, roughly nine in 10 Promise-eligible graduates used the scholarship to start a college or certificate program. But in the 10 years they had to use the Promise, only about half of those students actually earned a degree or credential. Jorth estimates that at least 1500 students have started college on the Promise but have not finished. The completion rate is especially low for certain groups of students who are working on a bachelor’s degree. First, there’s a racial gap. The Upjohn Institute looked at the classes of 2006 through 2012. Researchers wanted to know how many of those students had finished a bachelor’s degree six years after graduating. They found that on average, 47 percent of white Promise-eligible students finished college. The rate for Hispanic and Latino students was just 15 percent. For black students, who make up the majority of the district, it was 14 percent. That goes beyond just bachelor’s degree completion, as Upjohn also found a similar disparity across all degrees and credentials. “So there is definitely an undercurrent of racism in this equation,” said Regena Nelson, chair of Western Michigan University’s education department. She’s concerned that unrealized biases on the part of mostly white teaching staff could be affecting black students’ performance in school and ultimately their ability to succeed in college. “So some of the behaviors that they see in the classroom, they may not understand and even can perceive them as threatening and how they respond to those behaviors impacts black children,” she said. Nelson compared teachers misunderstanding their black students to cases of police officers shooting unarmed black people. Statewide, just six percent of public school teachers are black, according to the Michigan Department of Education. The number at KPS isn’t quite that low, but African-American teachers still make up just 13 percent of the regular teaching staff. KPS’ assistant superintendent for human resources, Sheila Dorsey-Smith, says the district recognizes that teachers’ biases might affect students. Among other measures, she says KPS has held mandatory and voluntary anti-bias trainings for teachers since 2015. Nelson, the education chair at Western, also sees an undercurrent of poverty behind some students’ struggles to finish college on the Promise. Looking again at classes from 2006 to 2012, the Upjohn Institute found that about half of students with a higher economic status finished a bachelor’s degree on the Promise. Just 14 percent of their less-well-off peers did. Nelson says poverty can put students at a disadvantage even before birth. “This could even be the mother who's carrying a baby, who is not getting enough nutrition for that baby to properly develop and they have early term birth,” Nelson said. “And then from there that child starts out behind and needs extra services to catch up even from birth. Race issues being the “dominant factor” behind that disparity is not convincing to Michelle Miller-Adams, a Promise researcher at Upjohn. “It probably has something to do with it, but my guess is that this gap is driven by the coincidence of race and poverty,” she said. 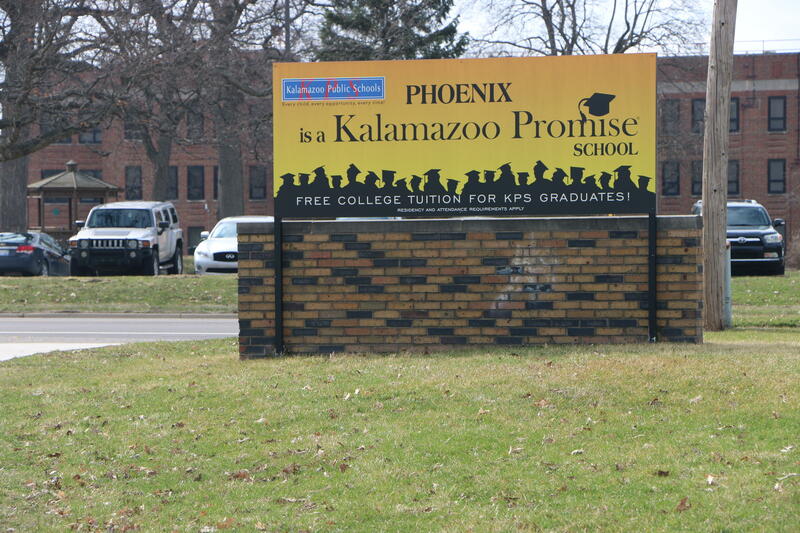 Miller-Adams wrote a book about the Kalamazoo Promise in 2009 and a second book about Promise programs across the country in 2015, both of which were published by Upjohn. She is also a professor of political science at Grand Valley State University. Free or reduced lunch is used in the data as an indicator of a family’s economic status. Whether a student qualifies for the assistance is determined by the state based on income and family size, according to the Michigan Department of Education. Overall 70 percent of KPS students have used free or reduced lunch, according to data provided by the district. The gaps that exist by race and economic status in could be attributed to a number of issues that students may face, Miller-Adams said. She noted examples of students having familial issues, lacking “peer groups,” needing to work and having a difficulty their managing their time or dealing with college as a first generation student. Those are some of the problems that might lead KPS graduates to drop out of college. What about solutions? Regena Nelson, the chair of Western’s educational studies department, sees hope for economically disadvantaged children in the Head Start preschool program. As for racial bias in the classroom, Nelson says “culturally responsive teaching” and “restorative justice” skills can help undo it. Nelson says training and educating teachers on how to handle their biases is an important step. And KPS and the Promise are taking their own steps to address the graduation gap, with the help of people such as Melissa Nesbitt. “Once upon a time I was a college dropout. And I didn’t have that support so I would like to be that support for the students now,” Nesbitt said. Nesbitt graduated from Kalamazoo Central High School in Kalamazoo in 2009. She used the Promise to start college at Michigan State University. She left in 2011, worked for a while and eventually returned to school, knowing she could still use the Promise. She earned her degree, and now Nesbitt works with Loy Norrix High School students and is one of three “pathway coaches” hired by the Promise. Nesbitt counsels students on Promise paperwork and federal student aid applications, as well - all the things that can overwhelm them if they don't know what to expect. KPS has made other changes too. It’s added a mentorship program. It’s worked to build what it calls a “future focused culture,” taking grade schoolers on college tours and holding ceremonies like Promise Signing Day. The district’s focus isn’t limited to sending students to college or post-secondary education, Superintendent Rice said. There are students who want to go straight into a job after high school or plan to join the military, Rice said. Despite the district’s efforts, there are still some disparities. KPS data obtained by WMUK through a Freedom of Information Act Request shows that overall black graduation rates for 2012 to 2017 were, on average, around seven points below the overall graduation rate. The overall graduation rate was, on average, around eight points below white graduation rates. The district notes that the four-year graduation rate has consistently increased for black male students, from 46.7 percent in 2013 to 61.5 percent in 2018. For all student groups, the four-year graduation rate in 2018 was 75.2 percent, compared to 65.2 percent in 2013. A large piece is educational exposure, he said. Families that have been lacking access to education for several generations may have a hard time supporting and assisting first generation students with their education at all levels. To help address that issue, KPS created a mentoring program, he said. The program is “largely but not exclusively” for males of color, Rice said. At Northeastern Elementary School, which is predominantly black, students chatter excitedly in the halls after getting certificates welcoming them to the Promise. The youngest have about 13 years until they finish high school. The question remains, what will the college graduation gap will look like in 2031? With 40 years of standup experience Poundstone calls herself “a proud member of endorphin production industry.” She will perform at the Tibbits Opera House in Coldwater on Thursday April 11th.